The Archaeological Border Complex of Hedeby and the Danevirke is a relict cultural landscape of a trading centre between Western and Northern Europe. 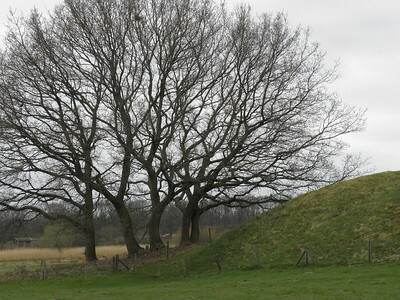 The designated area consists of a 33km long fortification, the Danevirke, and the archaeological site of the trading town Hedeby. The site consists of 22 locations, mainly segments of the former border wall. 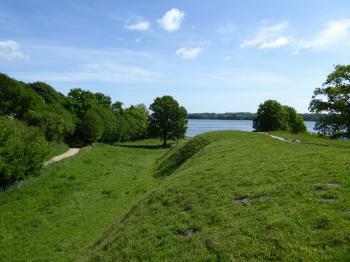 The Danevirke consists of several walls, trenches and the Schlei Barrier. Hedeby became a principal marketplace because of its geographical location on the major trade routes between the Frankish Empire and Scandinavia (north-south), and between the Baltic and the North Sea (east-west). Between 800 and 1000 the growing economic power of the Vikings led to its dramatic expansion as a major trading centre. I visited Danevirk and Hedeby on my way to the WHS of Jelling. There are several places where one can see the remains of the Danevirk (or Dannewerk in German), but the Viking Museum at Haithabu probably is the most worthwhile. The Danevirk was the Viking's equivalent to Hadrian's Wall: built to keep out the barbarians. It covered a stretch of 30km in what is now the German state of Schleswig-Holstein (formerly in Denmark). Hedeby / Haithabu was the most important town in the region. It was located along the shortcut route between North Sea and Baltic Sea. The Viking Museum at Haithabu has a modern presentation inside, though as so often there has not been found much of real interest from the Viking area. A lot of people seemed to have lost their money bag while getting on or off board in the harbour! The museum has a large outdoor part too. It holds a recreation of Haithabu on its original location, a part of the Dannewerk and the semicircular defensive walls of Haithabu itself. It's a great area for a longer hike: you can either walk on top of the Dannewerk, or do a full loop around the lake. Being born and raised in Schleswig Holstein, the Northern most state of Germany, I was made to visit Haithabu already at a young age. It features prominently in the local history lessons and we were taken there in elementary school as a school trip. My main memory was that it was fairly mundane: a big earthen circle and grass meadows. The reason the site is featured so heavily in the curriculum of local schools is that there actually is very little else of "early" history in Schleswig Holstein. Haithabu lay on the borders of the Holy Roman Empire of Charlemagne. Being strategically located on the Schlei, a bay on the Baltic Sea, it functioned as a major trade hub between the Holy Roman Empire and Northern Europe. For a time it was probably the largest urban settlement in Northern Europe, albeit that doesn't mean much. It is assumed up to 2000 people lived in Haithabu at it's peak. To put that into perspective, Cologne had 15.000 inhabitants, let alone Constantinople with at least 100.000. The most interesting story I remember from my history lessons in elementary school is that the vikings sailed the Schlei westward where they would land their ships and transport goods and ships via land for 18km to reach a tributary to the Eider river. Via the Eider they were able to reach the North Sea. This way they saved themselves the long and dangerous voyage around the Skagerak. Nowadays the sources are not sure if only the goods were moved or also the boats. Personally I prefer the image of Viking boats being landed and then rolled across land. Eventually Haithabu was disbanded and Schleswig on the the other side of the Schlei became the principal settlement of the area. So much so that the modern German state is still called by the town's name: Schleswig-Holstein. Having visited as an adult a few years back I think mundane still describes the site quite well. Just keep in mind that at the same time Haithabu was built Charlemagne had the Aachen Cathedral erected. Take the train to Schleswig and from there either a bus or a 40min walk. Deutsche Bahn has the details. There is an on-site museum showing a few of the finds. They also reconstructed some of the original buildings to give you an impression of the living conditions. If you have a car, you can also visit several parts of the border wall (Danewerk). In addition you should visit the state museum at Schloss Gottorf to see some of the finds. Schleswig itself has a nice reputation and the church features and impressive altar piece. Last but not least, the Schlei is quite a nice bay, especially if you traverse it by boat. If you plan to travel on, this should be part of the Hamburg Hotspot, specifically Lübeck and Wadden Sea are well within reach. You can also continue North to Christianfeld and Jelling. Some man involved in nominating this site for Germany came over to speak in my class during Winter Semester 2015-16 when I was still enrolled in the master's degree program "World Heritage Studies" in Germany and said that they had given up nominating this site as a transnational serial site with 4 other state parties and had decided to go alone at it; thus another nomination called "Hedeby and Danevirke, an archaeological border landscape." I took a Flix bus from Hamburg, which dropped me off at some gas station in Schleswig about 3 km away from the outdoor museum area. But luckily within a few minutes I found an elderly woman who lives in Busdorf near the museum and who gave me a ride to the museum area. I had seen this kind of reconstructed Viking houses in Lofoten Islands in Norway, Birka in Sweden and Trelleborg in Denmark. So I guess it may be a good idea to distinguish itself by presenting this area with such a different view point as archaeological border landscape with the remains of the earthwork. I visited the Hedeby site, which is well developed for tourists, with a museum (closed at the moment for refurbishment), walking pathes and reconstructed houses. Hedeby (or Haithabu in German) was a well-sized city at the edge of the viking lands. As with other viking sites (like Birka or Trelleborg) the problem is that almost everything was built out of wood, so there is not much left of it but the earthworks. 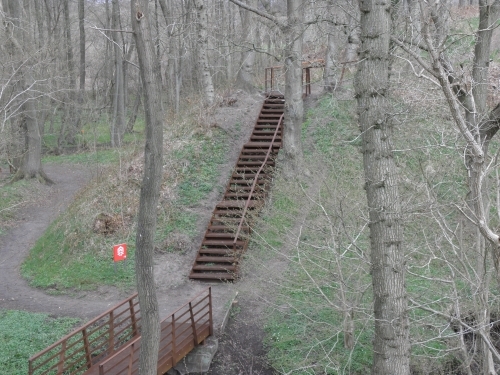 In the case of Hedeby, the earthen city walls are still standing (and walkable), but most of the area inside is empty. 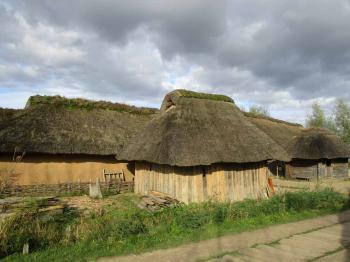 There are some quite nice reconstructions of viking houses, which will be the most interesting thing for most visitors. There are also demonstrations, market stalls and exhibition houses, so there is more to do than to stare at mounds. Also interesting is the visitable archaeological dig, although most finds seemed to be small things like nails or bone remains. 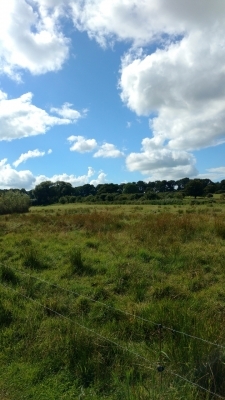 The whole area is rather idyllic, with a nice lake and an undisturbed environment. It is a good place for hiking. As there are no nearby settlements today, getting there can be a problem. It is rather easy with a car, as the main highway from the north (e.g. to Jelling) to the south (e.g. to Hamburg) is quite close, but public transport might be difficult. All in all, I had a very pleasant visit there, and really got a good impression of how they lived in the viking times. However, the most interesting things are reconstructions (Kind of like Unteruhldingen with the pile dwellings). Therefore it is hard to judge the worthiness and OUV of the site. 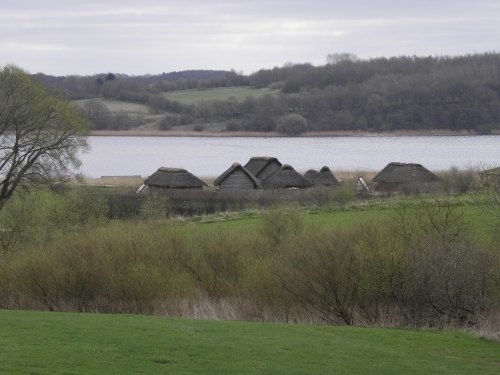 Destroyed during invasion: Hedeby was destroyed by the Slavs in 1066. Underwater Archaeology: Location 1553-019 "Offshore Work"
Viking settlements: Hedeby is a Viking era trading settlement. Textiles: The numerous pit houses in Hedeby probably served to process textiles during summer. 36 Community Members have visited.